There are events in the history of all countries that have a strong influence on modern days ways. It is said that the great earthquake of Lisbon on 1755 caused a whole change on the people of Portugual. Taking inspiration on the set of events, the Portuguese quintet MOONSPELL comes with their twelfth album, “1755”, using it as a whole concept to make one of the finest albums of this year. The quintet still keeps their same musical personality, the contrast between the aggressive influences from their earlier times with the elegant aesthetics of Doom/Gothic Metal. But now, there are some Wagnerian and Gregorian choirs and excellent orchestrations, with dissonant moments of the guitars contrasting with the crescendos of keyboards, the solid work from bass guitar and drums giving a heavy rhythmic support to each song, with keyboards using a different approach with classical moments along with that horror atmosphere from before, and the vocals uses different tunes of voices, from gothic whispers to harsh screams. As the album concept is about a historical event of Portugal, all the lyrics are in Portuguese, so be prepared to use your best translator for your understanding (and let me tell you, it worth a try, indeed). The sound production as done by Tue Madsen (who worked with bands as MESHUGGAH, DARK TRANQUILITY, DIE APOKALYPTISCHEN REITER and THE HAUNTED, to name a few), and he gave used a clean aesthetics to build the album’s sonority. Of course, the aggressiveness is presented in a dry format with clear tunes, but with some rawness is present to give the heavy sound of a Metal band. It seems to us that the band with Tue had a very hard work to do things in this way, but they did, and the cover artwork was done by João Diogo, to give the right idea of the concept, the terror and chaos caused by the earthquake. The fear, anguish, the dismal mix of feelings of Portuguese people facing such event (according to Seismologists, the magnitude of the Lisbon earthquake is estimated to reach the range 8.5-9.0 on Richter scale, with a death toll estimated of 10000 to 100000 people) is translated with a perfect dark and aggressive insight by the quintet. Songs as the introduction “Em Nome do Medo” with its introspective aura and fine work on vocals, the excellent work from bass guitar and drums on the grandiosity presented on “1755” with its wonderful melodies and very good choirs, the mix between fine melodic moments with a Gothic aesthetics with very good guitars that fills “In Tremor Dei”, the abrasive weight of “Desastre” (another great moment from the vocals) and “Abanão” (very good choirs and again bass and drums are excellent), the heavier and aggressive melodies of “Evento” with fine keyboards parts (and it is one of the songs of the album chosen to become lyric videos), the excellent riffs and solos from “1 de Novembro” (filled with very hooking melodies, indeed), the oppressive atmosphere of the musical prayer adorned with oriental melodies called “Ruínas” (another great moments from the vocals, making a fine contrast with the keyboards, and the feeling of the song goes from the melancholic rage with to a desperate beg for mercy), the aggressive and introspective insight of “Todos os Santos” (another very good use of the mix of the band’s influence, what results in a hooking and aggressive song with introspective melodies), and their personalized and sinister version for an old Pop song from Brazilian band PARALAMAS DO SUCESSO (a success here on the 80s), called “Lanterna dos Afogados”, maybe representing the dead due the tsunami that followed the earthquake. 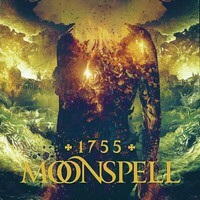 So we can say that MOONSPELL made another great album, and telling the history of the Lisbon earthquake in “1775”, they reached another level of musical quality. Saúdo-vos, patrícios de além mar!